100% Printed Cotton Labels - Affordable Eco-Friendly Labels !! 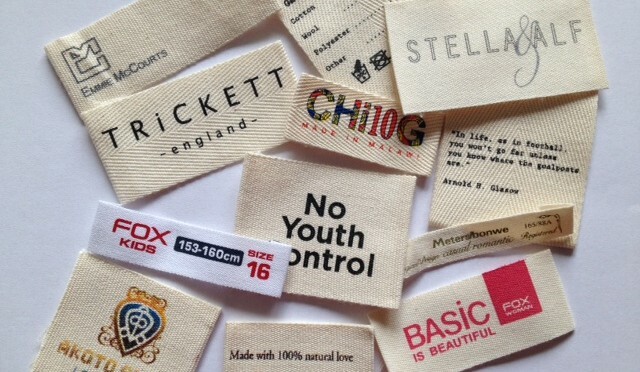 We produce Eco-friendly, 100% cotton labels. Our screen printing (hand-print) solution creates high-definition printed cotton clothing labels. These soft cotton fabric labels are perfect branding labels for natural fiber apparel, bedding, pillows, and furniture products. The printing colours of our customized cotton fabric labels hold extremely well in laundry and machine washing. Choose your favorite cotton fabric: twill, taffeta, plain taffeta, herringbone, canvas, and grosgrain cotton fabric. All cotton fabric are woven edge; the option of widths ranging from 10 mm to 200 mm. There is no constraint on the cotton label lengths. We can print up to 6 colours on cotton fabric labels. You can have any colours you like; all vivid, and dynamic colours. Due to the nature of 100% cotton fabric label, the fabric has to be cold cut only, and the cutting edge will fray. Therefore, the finished process of cotton label must be two-end fold, or centre-fold. The fraying is only on the ends that would be sewn into garment/hem. We can also deliver your cotton labels on a roll. Contact our sales team on below email. We will help to custom and create a 100% nature-friendly, printed cotton labels for your clothing line, handmade creations, and bedding products. We offer competitive quote, free cotton label sampling, and free UK delivery.